Philadelphia, Pennsylvania – August 3, 2016 – Janney Montgomery Scott LLC (“Janney”), a leading full-service wealth management, financial services and investment banking firm headquartered in Philadelphia, PA today announced that Gerald Scheinker, Executive Vice President/Wealth Management and senior partner of Scheinker Investment Partners has been named to the 2016 “America’s Top Wealth Advisors” published by Forbes. Jerry Scheinker, whose expertise lies in equity research and fixed income allocations, serves as Executive Vice President/Wealth Management and senior partner of Scheinker Investment Partners at Janney Montgomery Scott. Throughout his career, spanning over 50 years, he has been awarded with honors from various financial services firms and was named a Barron’s “Top Advisor” in 2006, 2007, 2008, 2009, 2011, 2012, 2013, 2014, 2015 and 2016 and a “Top 400 Financial Advisor” by Financial Times in 2013. 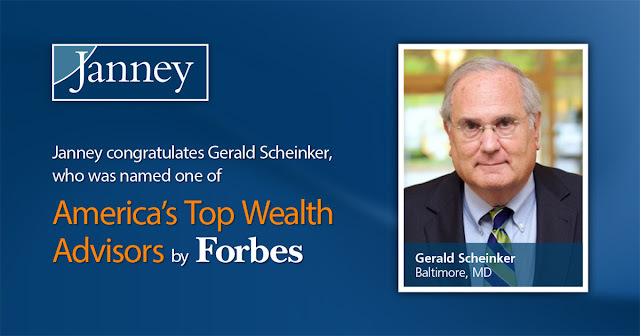 A member of Janney’s premier CEO Roundtable, Scheinker is a graduate of Mount Vernon School of Law and the Institute of Investment Banking at the Wharton School at the University of Pennsylvania.